Shall we go on a rescue mission today? Of the renovation variety? Are you up for it? It'll be a bit of hard work, a bit of money and a bit of imagination in real life, but today we only need the imagination quota. And the reward would be a gloriously glamorous home of elaborate character. The star of our rescue mission is a gracious home built in 1926, in the then very-fashionable Spanish Mission style, in leafy Toorak, Melbourne, which is up for sale. First up, what is this style called Spanish Mission? Well, it originated in California in the early 20th century, around 1915, where it became known as Spanish Colonial Revival architecture, a romantic interpretation of the earlier buildings erected by the Spanish missionaries throughout Mexico, California, Texas and Arizona in the 19th century. Both versions shared distinctive stylised elements: notably white stucco walls, terracotta roof tiles, elaborate forged iron balustrades & grilles, low pitched roofs, lots of arches, exposed timber framing. The 20th century version also often incorporated the distinctive "barley twist" column. Oh how I love them! Utterly indulgent, really. So what happened in 1915, to create this new interest in an old style of architecture? This was an incredibly ornamental style of architecture, especially when you think that at the same time, in Europe, the origins of Bauhaus were beginning. So what's all this got to do with our rescue mission in Melbourne??? Well, with all the glamour of the Silent Movies of the 1920s being seen in the glamorous new Picture Palaces, everybody wanted some of the action. So this new style of architecture became very fashionable with the smart young things around the world. So, now to get into our steel-capped boots, hard hats and overalls, because we have some work to do. So far, we have some nice parquetry flooring, in herringbone, arched windows and sunshine-filled rooms. This room has fabulous potential, with a trio of windows and rather wonderful cornices and plaster mouldings. An enormous bedroom.... with a fireplace and two walls with windows, including rather charming arched ones at the back. Oh, yes, much better...it's coming to life. How about the living areas now? Painting the windows in dark tones, either black or dark charcoals, with walls in a mottled, lime washed white (preferably with a fresco type of paint, rather than a flat acrylic) will create the right backdrop. Then adding curtains of unbleached linen, to sway in the breeze from the many windows. Some Spanish Revival touches are needed, but not too many or this will look like a museum. Instead, bringing in some mid century and 1970s glam with brass pieces will add the bold look, without it looking too themed. 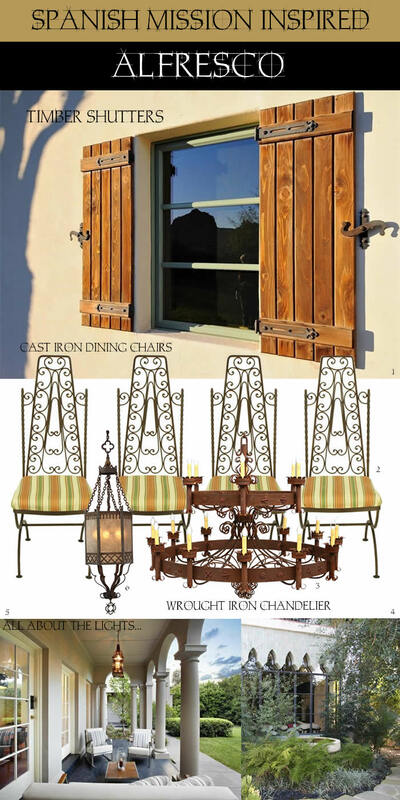 Because a strong part of the appeal of a Spanish Mission home is the link between outdoors & indoors, the adjoining alfresco area is a very important part of the plan. This can either be in courtyard form, or as a loggia running along the side of the house. Either way, it needs to be furnished as thoughtfully as the interior, so that it is an appealing place to be, to draw visitors out to enjoy its cosy, protected enclave. So our house is taking shape... looking much more elegant and a lot more glamorous. Which just leaves the front entry to think about. After all, it's the first glimpse into the personality of the house, and it's a chance to tantalise with a little of that Spanish Mission drama. A couple of terracotta pots arranged asymmetrically, and filled with trailing cascades of plants should do the trick. It gives a clue as to the style of the house: informal yet stylish, bold yet unpretentious, chic yet a little wistful: a 21st century interpretation of the 1926 Spanish Mission style, with all that Hollywood glamour of the era. So here's hoping somebody purchases this house with a heart for a Rescue Mission, because it would be a tragic loss to architectural history for it to be bulldozed. Those barley twist columns alone are worthy! Do you think it's worth saving the rest, to be re-imagined into a glamorous home for today?